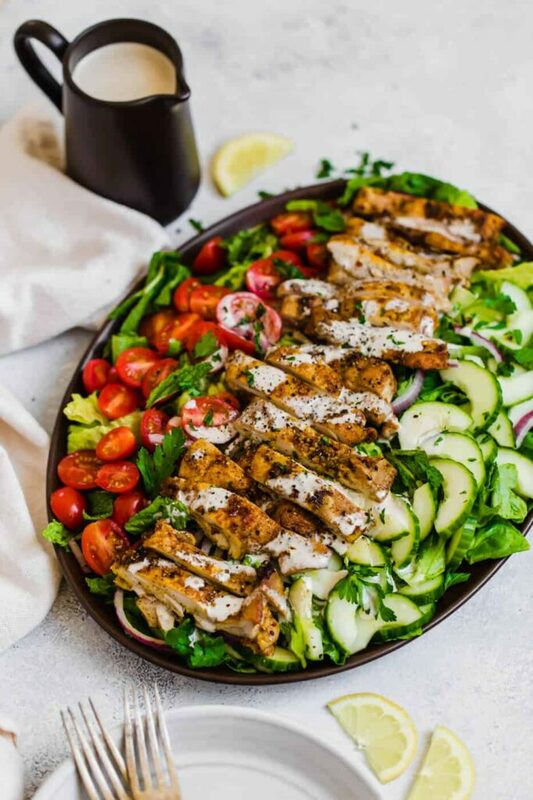 A chicken shawarma salad that will quickly become your favorite summer dish. It is reminiscent of a chicken shawarma dish you’d order at any fabulous Greek restaurant and is packed full of flavor thanks to the fresh parsley and mint. This recipe was adapted from and inspired by this recipe by Our Salty Kitchen! It’s been a very busy and fun-filled week here at our house. We are nesting like crazy and trying to get everything put together before baby girl makes her debut in July. I was so grateful that we had leftover chicken shawarma salad in the refrigerator waiting for me a few nights this week. Putting together the nursery has definitely been the most exciting, yet most challenging for the two of us. We are wanting to really take our time in making sure that we being mindful about what we decide on purchasing. We also understand that she probably won’t be spending too much time in the nursery the first few months. … am I right? Everything else is a want vs. a need. I’ve actually been feeling a lot more stress during the third trimester than I did during the first. I would say this pregnancy has been very, very easy thus far though. Sure, she moves around very aggressively and constantly, but it warms my heart that I pretty much am always reassured she is doing well in there. Her being super active is a great sign, and I can’t wait to see what her temperament is like after she comes out of me! 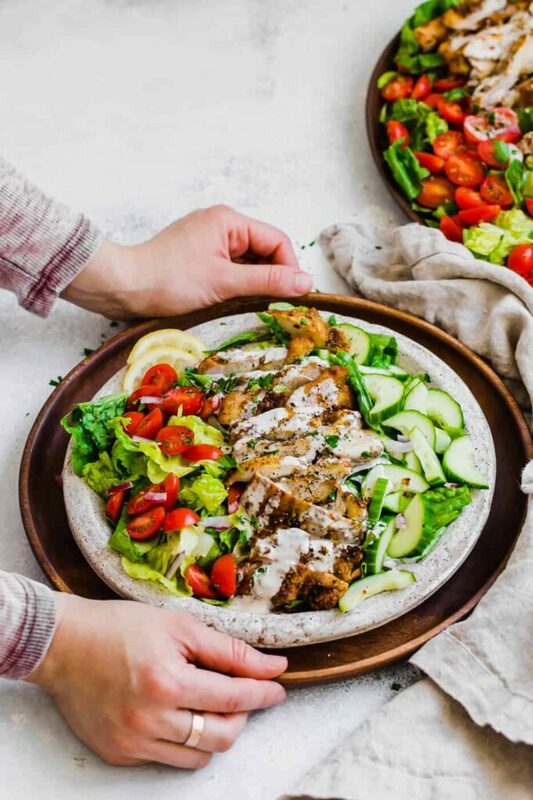 But back to this delicious chicken shawarma… you’re going to really love on it. Let me tell you why…! First of all, I love using chicken thighs for any and all recipes I make with chicken in them. They are incredibly succulent, juicy & cook very quickly. I would say they are the hardest part of the chicken to mess up. I love how easy the marinade is to whip up, and the flavors it lends to the dish are out of this world! I’ve realized over the years that adding fresh herbs to salads makes a world of a difference. 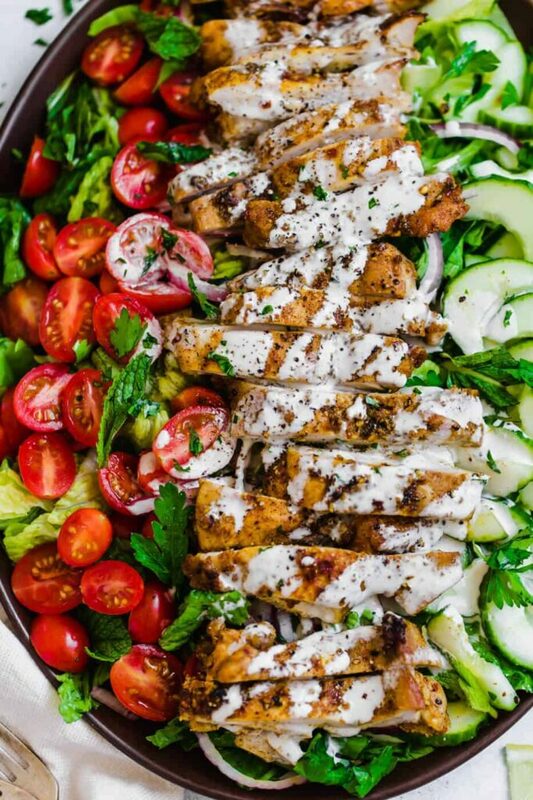 The fresh parsley and mint in this chicken shawarma salad are so darn refreshing, folks! I knew I wanted to pair a tahini style dressing with the dish, but I have also come to realize that my Whole30 compliant tzatziki dressing would also be absolutely fabulous on this salad. I paired the tztaziki with a Greek salad I had made. 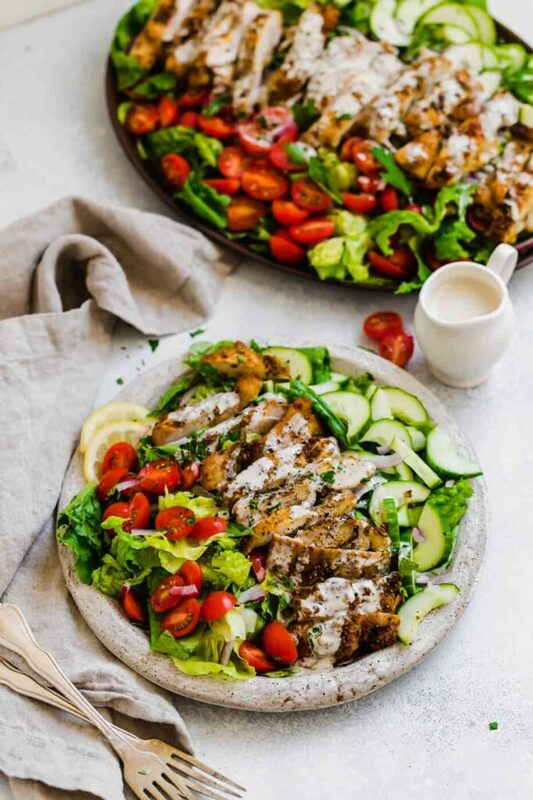 Naturally (since chicken shawarma is a Greek-inspired recipe), either dressing will compliment this dish wonderfully! You can whip up the marinade for this dish the morning of and let the chicken hang out in it for a few hours in the refrigerator. However *if you have the time,* I’d recommend letting it settle in the marinade overnight if possible. You really want all of those lovely ingredients to completely fuse with the chicken. The dressing can also be made ahead of time, but it’s unnecessary as it only takes a few minutes to put together. Feel free to double up on the amount of chicken you are making, as you’ll have plenty of leftover dressing that can be used as a dip after you finish gobbling up this salad! I know I am going to making this fabulous Whole30 compliant salad all year long. I recommend keeping the dressing in a separate container in order to keep the components of the salad tasting snappy and fresh for longer. 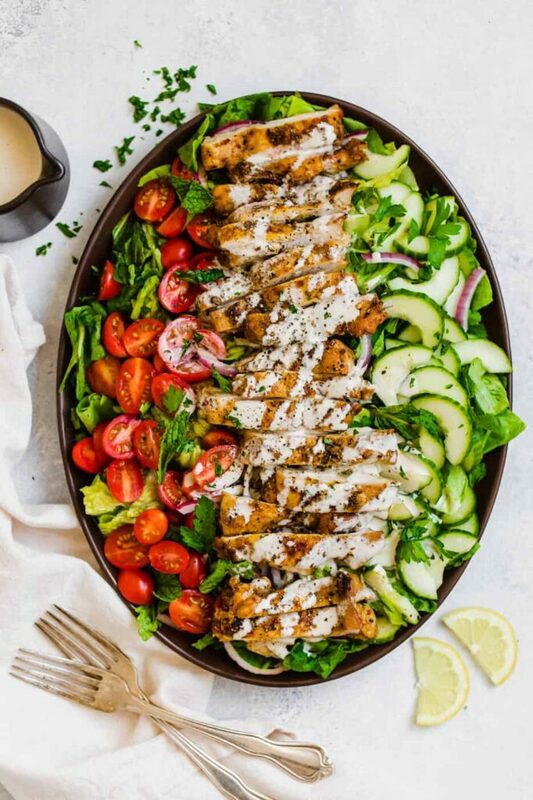 Be sure to add chicken shawarma salad to your weekly rotation. You’re going to be glad you did! 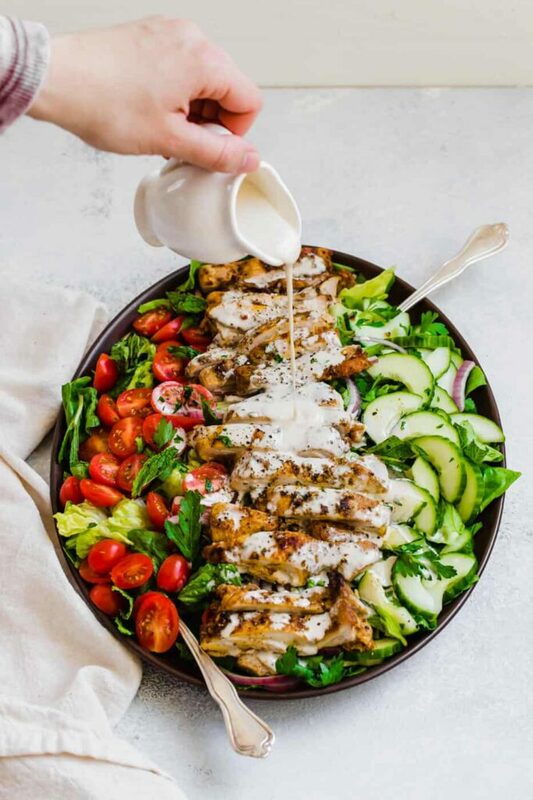 A chicken shawarma salad that will quickly become your favorite summer dish. It is reminiscent of a chicken shawarma dish you'd order at any fabulous Greek restaurant and is packed full of flavor thanks to the fresh parsley and mint. In a small bowl, whisk together the marinade ingredients until well combined. Place chicken thighs into a gallon zipper bag and pour the marinade over the chicken pieces. Rub the marinade into the chicken with your hands. Be sure to release all of the air out of the bag and seal it shut. Transfer to the refrigerator to marinade. It needs at least 4 hours, but if you have time, let it sit overnight. When you are ready to work with the chicken, preheat the oven to 425 degrees Fahrenheit and adjust the oven rack to the middle position. Line a rimmed baking sheet with foil or parchment paper. Transfer the chicken to the prepared baking sheet. Pour the extra marinade over the chicken. Roast for 30 minutes until it is cooked through. Remove from the oven to let cool and slice into strips. Set aside. In a food processor, combine all of the ingredients. Process on high until mixture is thoroughly combined and smooth. If it's too thick, add a bit of water until the sauce/dip reaches desired consistency. I don't usually add very much as I prefer my salad dressings to be on the thicker side. Set aside. Layer the tomatoes, cucumbers, and red onions over the salad base. Top with the roasted chicken. Add the tahini dressing and toss well. Serve right away and enjoy. Your recipe for dressing ingredients calls for tahini and 3 tablespoons of water, but in the directions for mixing the dressing it says to combine “all” ingredients and process until smooth. Are there more ingredients than just tahini and water? Hi Lisa. I’m so sorry about that. Those are the only ingredients… I reference a tahini recipe to make (using an outside link) which is why I say “all”… does that make sense? How much tahini? What’s the measurement? My tahini was fairly watery by when I added water it went completely solid like a thick paste! Hi, I’m so sorry to hear that… that is very strange! It turned into a thick paste AFTER adding water? I’d recommend adding more oil until it thins out. You don’t give a measurement for how much tahini you mix with 3 Tbs of water. How much tahini?? Hi, Just not clear how much tahini to use if I use store bought? I bought it at trader joes. The whole bottle? I would use 10-12 ounces. You want it to be a little bit thick but pourable! i was visiting your blog earlier today and this recipe caught my eye… one of our favorite dishes to eat out at a local greek restaurant. however, we will be moving soon and i want to learn how to make this. also… best of luck on the nursery… just remember, it’s all about the moments, not the things! you’re going to be an amazing mama!